October 2, 2016 0 comments on "The Gratitude Wreath"
2. As a base, use an 18-inch diameter straw or styrofoam wreath. 4. 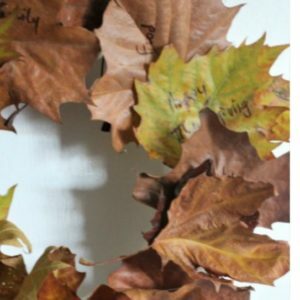 Using a paint pen on the leaves (a sharpie will also work), have each member of the family write down what they are most thankful for. 5. Starting at the top and working clockwise, tuck the stems of two or three leaves into each band of elastic. Try to arrange the leaves so that no elastic or straw shows. If necessary, use a hot glue gun to hold the leaves in place. This wreath should take about 15 minutes to construct. Hang the finished wreath on the front door and celebrate all of your family’s blessings. About the Authors: Rondi Hillstrom Davis and Janell Sewall Oakes are the co-authors of the award-winning book Together: Creating Family Traditions. To check out their website that’s jam packed with family ideas, visit https://www.togetherparenting.com.